It is a question I’m sure parents have been asking themselves since the beginning of time. I’ve no doubt that the threat of Viking invasion weighed heavily on the hearts of some Anglo-Saxon parents in the 9th Century. My parents, who raised two boys in the 1980’s in Northern Ireland, must have wondered constantly what the future would hold. So here we are, 2017, and I find myself wondering the same thing. The path for global politics seems to be decided by a slim and fluctuating majority. In every scenario there is a significantly large proportion of the population who disagree. We voted, things didn’t go our way. Letters of protestation to MPs have changed little. For the first time in my life I feel rather powerless when watching the news. My wife and I came to the conclusion that the only thing we can do is affect our immediate sphere of influence. On my own I’m not going to swing a vote in the House of Commons, but I can be friendly to my neighbours. I can go someway toward making people feel like their community is a welcoming one, to keep them from letting the fear of isolationism creep in. At its heart this blog post is a review of my local coffee shop. 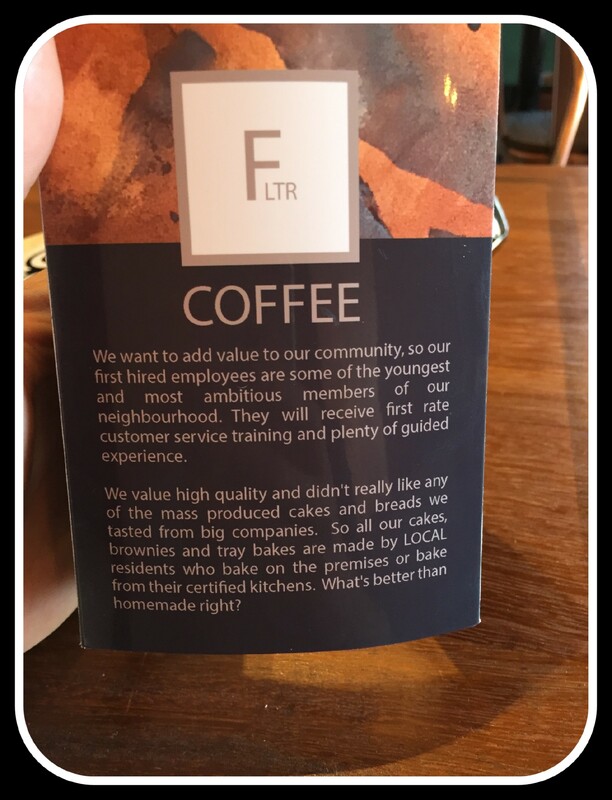 So that introduction might seem rather hyperbolic for the fairly small family owned cafe in Oxfordshire. However FLTR believe, and I’m inclined to agree, that they are more than that. 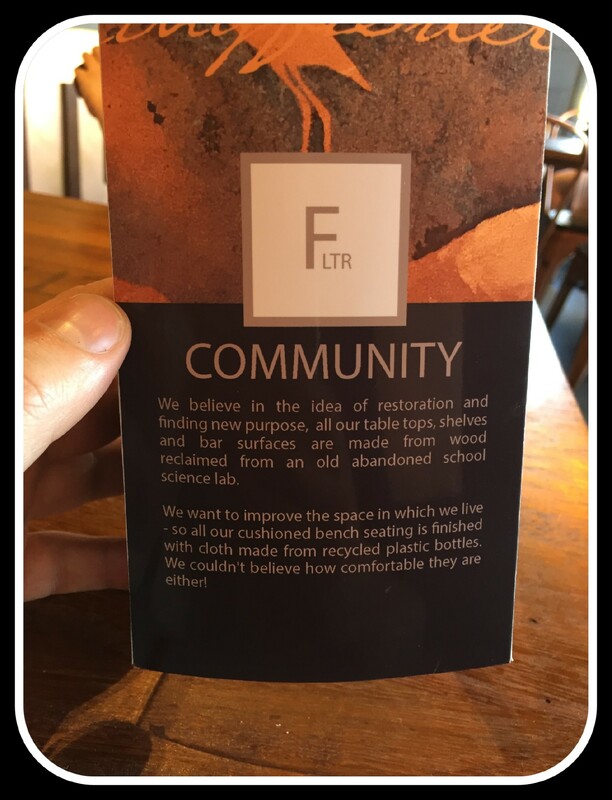 This coffee shop is a bold step towards the kind of inclusive community projects that so many people desire. Jeff, Christie, Sarah, Steve and the rest are thrusting themselves forward as shining lights of community spirit. The shop itself has been crowdfunded, the decor (lovely artisan wood and copper piping) is reclaimed and recycled, the owners are local residents and employees are local teenagers, they aren’t even planning on making a profit! You read that right, after costs, the surplus money will be pumped back into local projects in the shop’s location of Langford Village, Bicester. Their full, rather amazing story, can be found here. I always thought Langford Village does fairly well. Its got a Tesco, a pharmacy, a Chinese takeaway and a nice welcoming pub. What more could one really ask for? Well it turns out that a classy independent coffee shop is exactly what it didn’t know it needed. Located right beside the school I suspect it’ll be a struggle to get a seat in term time. So, desperate to make the most of the April sunshine, baby was loaded into the buggy and 4 year old onto his Big Boy Bike and off we set for FTLR‘s Opening Day. When we arrived there was immediately a friendly face offering to grab us a high chair and suggesting space we could park the buggy. On display were a great collection of cakes, created and donated by local residents, at an excellent price (£1.50ish). Two brownies (for us), one giant Victoria sponge (for the 4 year old! ), one juice drink, one bottle of sparkling water, and one Americano later, we were sat at a table only £10 lighter. The two floor-to-ceiling glass windows at the front made the space feel very open. I got chatting with Steve and felt slightly embarrassed when he asked how my Americano was. I confessed I’m not much of a connoisseur. This one was smooth and tasty but normally, as a father of two, coffee serves a functional rather than pleasurable purpose in my life. With no hint of judgement in his voice he laughed and suggested I try their V60 range. Beans from different countries (Brazil, Rwanda, Java) that they will use to make the coffee in front of you and coach you through what you should be tasting and why it is more than simply a medium to mainline that caffeine into your system. I’m aware this blog isn’t a national political platform, and FLTR know they aren’t going to change the world. But they will have an affect on their sphere of influence. They will give people somewhere nice to sit and rest and chat to each other. They will give some of the local youths a sense of confidence and purpose that can be so critical at that age. In doing so, they will do SOMETHING. Increasingly I think that is enough. That we don’t give up, we don’t despair, but instead we influence those around us in the small and positive ways we can. So, if you find yourself in Bicester, get away from the consumerist allure of Bicester Village and head over to FLTR. Grab yourself a cup of coffee and a cake, then sit back and bathe in that feeling of true homegrown community. If you enjoyed this article you can comment and follow me on Twitter @maddadskillz or Facebook or Instagram. A heart-warming review, Andrew, and fully echoed. Well written and well deserved, especially given some of the antagonism directed towards the coffee shop in the early days. May FLTR and its like, thrive and prosper and may we all take a leaf out of their book. Happy communities mean people talking to each other and everyone feeling involved and all the better for it. Brilliant review and great to read how this new cafe offers something different than just ‘nice coffee.’ I wholeheartedly agree with your comment in this post, that there have always been things in this life that we as parents worry about for our children, but changing their world often starts by changing their community. 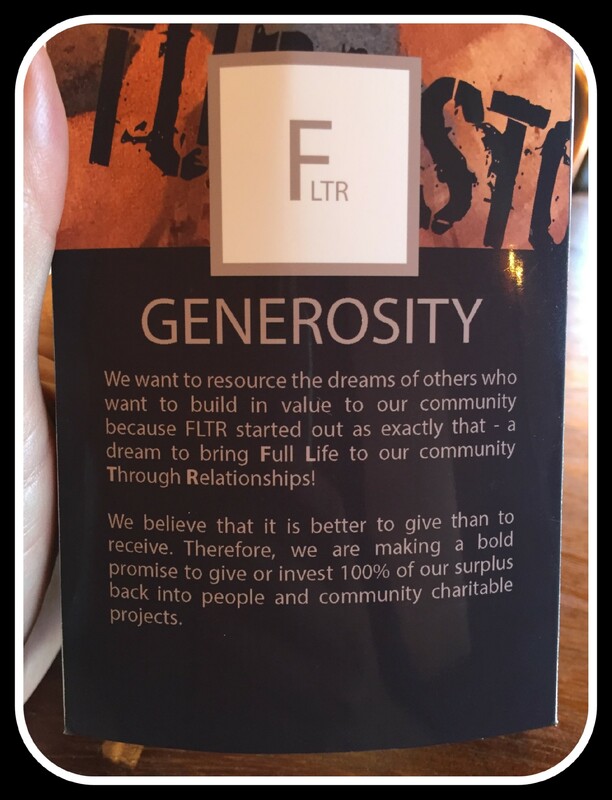 I love the sentiment and efforts being made by FLTR and I really hope it is embraced and supported by its community. As a fellow Oxfordshire blogger I hope to be able to make it over for a coffee very soon! Well thanks for the kind words Tracey. Maybe we could have an Oxfordshire Bloggers meetup there!